It's time for the next episode in the Table Top biweekly series hosted by Star Trek's Wil Wheaton on Felicia Day's Channel Geek and Sundry. Today Wil and friends are playing the party-style game, Wits & Wagers. This week Wil has fun pitting are Veronica Belmont (video host), Phil LaMarr (actor), Jimmy Wong (actor, musician, filmmaker). There's a reason that Wits & Wagers lays claim to "The Most Award Winning Party Game...". It has won many awards from "Major fun! Award, to Mensa Select, to Part Game of the Year for 2007, an on and on. 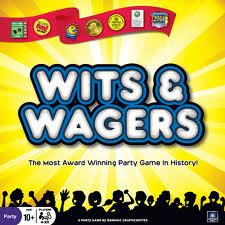 You will find Wits & Wagers in stock and available here at Off The Charts Games. We also have an open game in our Store Demo Library available for play while you are here.